Today was the first step in our project. Our job today was to remove all the seating in the bus. We really didn't know what to expect. 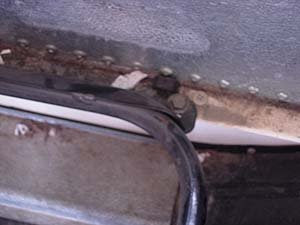 I had helped remove seats in another bus once before and it was really easy. This time it was a little more difficult. I had read a lot online of how others have done this. 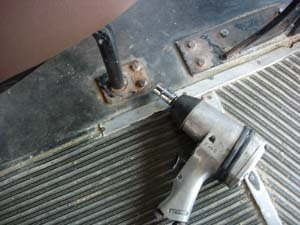 Most the articles I read showed people using a grinder to cut out the bolts that held the seats down. This looked like a messy, dirty and unhealthy job. I chose to use an Impact wrench and a standard wrench. 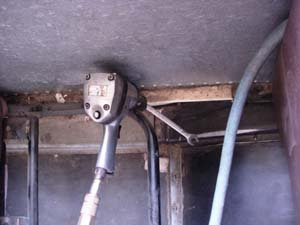 One person was inside the bus with the impact wrench while the other was under the bus. We needed a 1/2 socket and wrench to do the job. 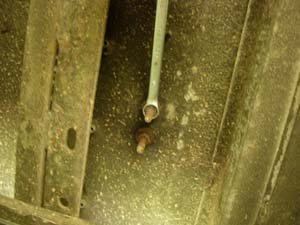 The person under the bus held the bolt in place while the other used the impact wrench to unscrew the bolt. This was the most time consuming part. We focused only on the bolts on each side of the isle first. After all the bolts were out (took about 5 hours) I then focused on removing all the bolts that attached the seats to the walls. Again I used a 1/2 Socket for the impact wrench and for the wrench. This part went pretty quick. This picture is looking down on the rail that the seats are bolted into. Now all the seats are out and loaded on a trailer, ready to go to the dump. I kept out 2 of the best seats to use for the dinette that will also convert into a bed. 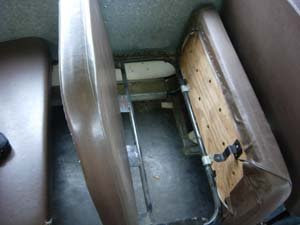 When we were removing the seats we noticed a few soft spots in the floor and decided to go ahead and pull up some of the rubber lining that covers the floor of the bus. It looks like all the plywood floor over the years has gotten wet and has rotted. So the bus will be getting a new wood floor. 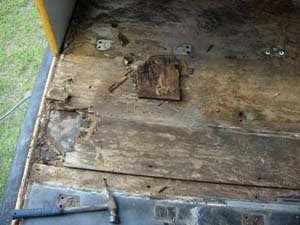 The galvanized metal underneath the wood still seems to be in good condition. That is a relief. The next project will be to remove all the rubber lining and old plywood. 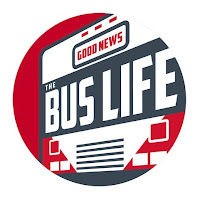 Can someone tell where can I buy school bus safely online? I live in Europe and I'd love to have one. Is there anything you would change about how you did the floor? Do you mean the wood floor we put down or the subfloor? Nothing comes to mind as being a problem with the floor we did. I was wondering about the subfloor. We are getting ready to put down the subfloor in our bus and there are so many ways to do it! For those of you doing this, I thought I would share a slightly easier method I discovered, at least on the BlueBird Tc2000 chassis. 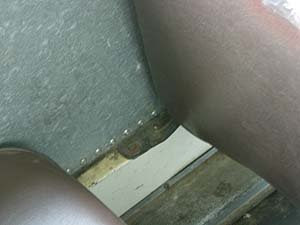 If you use the impact under the bus, the bolts have a locking mechanism on the bolt side, that is activated by compression, so if your lucky the nuts come right off leaving the bolts still compressed into to the seats in the bus. This worked for all but about 5 of the seats where they broke loose before the nut came all the way off. Those I just cut off from inside the bus since I didn't have help readily available to back up with a wrench at the time I was working on it.